Sometimes it’s a challenge to get your boss to sign-off on conference attendance. Below we have six top reasons why ARVR INNOVATE is one conference that you simply must attend in 2019. Our conference is only about AR and VR — it’s decidedly not a catch-all tech event where you might struggle to find what you are looking for. Everyone speaking has a specific story to tell on how AR and VR can work for your company. As we only run one conference annually, we take great care to curate a speaker roster which delivers real insights for you. 2 AR and VR save you money. The productivity gains being cited by companies such as DHL, Boeing and Xerox are great examples, and we will be sharing the metrics at the conference. Mention this to your boss. Bosses love this…and the end result of money savings! 3 Takeaways to apply immediately. Whether or not you invest in the technology immediately, you will learn so many things at the conference, from the speakers, exhibitors and your fellow delegates. 4 Chance to network with others in this space. We will have hundreds of delegates who share your interest in emerging tech. This is one of Europe’s best spaces to do this in, and of course Dublin as a location offers a great social networking backdrop. ARVR INNOVATE is an great opportunity to mingle with industry leaders and see product demonstrations from our exhibitors of brand new immersive technology methods and tools. We will have over 25 exhibitors – get a chance to actually try the technology out and ask questions. 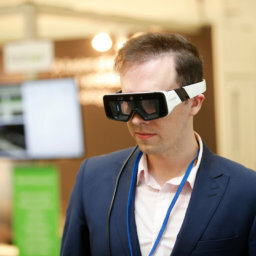 You could go to a conference in Europe and pay up to ten times the delegate fee for ARVR INNOVATE for a lesser experience — we are dedicated to providing you the chance to bring an entire team to the event so you can maximise the learning from the conference, workshop and exhibition areas.